Located in Historic Downtown Melbourne. Chameleon Soul Gallery is located one street North of Strawbridge Ave. and adjacent from the North entrance to City Hall and the Public Parking Garage. We look forward to hearing from you and will respond to your inquiry as soon as we are able. 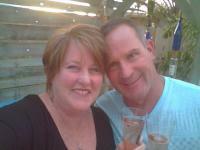 Owners Mary and Roy Daugherty are pleased to begin their new journey as they prepare for Roy's retirement from his 38 year Air Force career. With a love of working together and the desire to creatively steward unused material items onto their new journeys...the Chameleon Soul Gallery evolved. They look forward to providing an inviting and engaging space for like-minded artisans and for the community to have an outlet to Release Their Creative Souls!. Randi Dalfonzo is the resident Florida Unicorn SPiTMaster. In 2015, after discovering Unicorn Spit online and being one of the first to purchase the product, she quickly became intrigued with Unicorn SPiT as a finishing agent for her upcycled and repurposing projects sold through her company - ZENgara Designs. 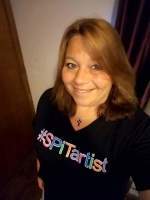 Since her first SPiT project, Randi has designed and sold hundreds of pieces finished with Unicorn SPiT, as well as volunteering as an Administrator for the official Unicorn Spit Q & A Facebook Business Page. She is one of the most well regarded artists for her varied use of Unicorn SPiT! Amelia Woodbridge has been making things her whole life. 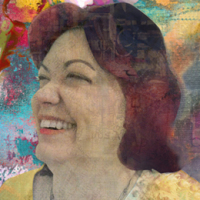 It allows her to explore her creative soul and have tons of fun. Making scrapbooks that become storybooks of the lives of her family is something she truly loves. Married, with two daughters, she live in sunny Florida where she enjoys cooking (and eating of course) binging movies and TV when crafting and spending time with friends.